Bloggers always have same tension of how to increase their revenue either they are using Google Ad Sense or any other website to generate revenue from their blog. I have also been searching for any trick or tip to increase my own revenue. After searching, reading and understanding every pin and point of Online earnings I found out some interesting facts for increasing my blog revenue. So today I am going to share it with you. To help you increase your revenue as well. These ways are been adopted by many big website owners and blog owners to generate a large amount of revenue per month. Your blog should be well maintained, neat and clean type. It can be congested because it will help you get more clicks through rate for your blog. SEO optimization for your blog is really needed for having a full prepared blog to start earning. There are 100’s of SEO optimized blogger template, and for Word-press blogs also. I have already talked about SEO optimization for your website. Loading speed is the major factor which can increase or decrease your blog visitor’s count. If your blog loads under 1second then is good if anything more than that will affect the visitor rate. So these were some of the major area to look upon before starting to earn a big amount of sum per month, because as more you focus on your blog and its article more chances you have to make a good amount of revenue from your blog. 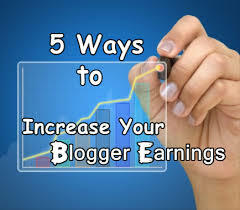 Now, Talking about the main topic there are basically 5 ways to increase your blog earning and there are not the old one that you find on every blog, these are different. Yes, promoting will get you more and more visitors on your blog. This will increase your page views right! Yes, increase in page views mean increase in the ad’s impression, more of the website paying you for showing ad’s also pays of 1000 hits on their ads. Mostly they pay 2-3$ per 1000 hits on your blog. So this will increase your blog earnings for sure. Again, having the ad’s relating to your blog article will help you getting your visitors attention toward the ads and surly some of them click on that ad’s. Mostly people don’t click on ad’s because they know they are ad’s but if you mingle it’s with the content then they will be confused and will be tricked into clicking the ad’s eventually. Yes, writing unique article will quickly get you into the Google Search ranking. This will increase your daily organic page views. Having got recognized by Google Search engine. As your Hits increase your chances to get 2$-3$ per day increases. These are really a great ways to follow. Keep on sharing post like this. Thanks for this post. Thanks for comment. Hope you like my other articles also. nice article very useful thanks for sharing. Thanks anshuma for the comment.